On the 12th of September 2017, the tropical depression ‘Maring’ carried possibly the heaviest rainfall of the year the country has experienced so far. Flooding was enormous in most of Luzon, which victimized thousands of residents, with some homes washed off, and lives lost. Many were stranded, caught off-guard and couldn’t go home. Classes and works were cancelled, and some modes of transportation just couldn’t do with too much water on the streets rising. With the tropical depression flooding the streets of Luzon, the National Disaster Risk Reduction Management Council however flooded as well, although it was on our phone inboxes. 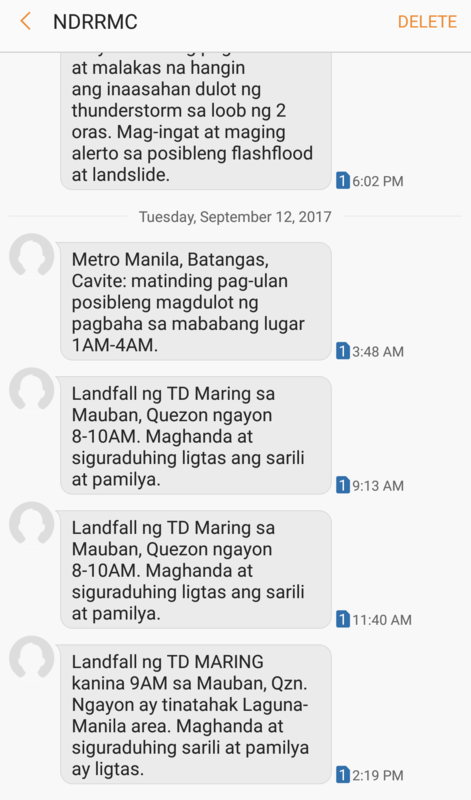 Hopefully with this action, agencies, private and/or government, are inspired to utilize bulk messaging more the way NDRRMC did. Want to know more about Bulk Messaging? Check out Busybee now and know more!